Tricider is a web-based tool to generate and evaluate ideas and to support class discussions. 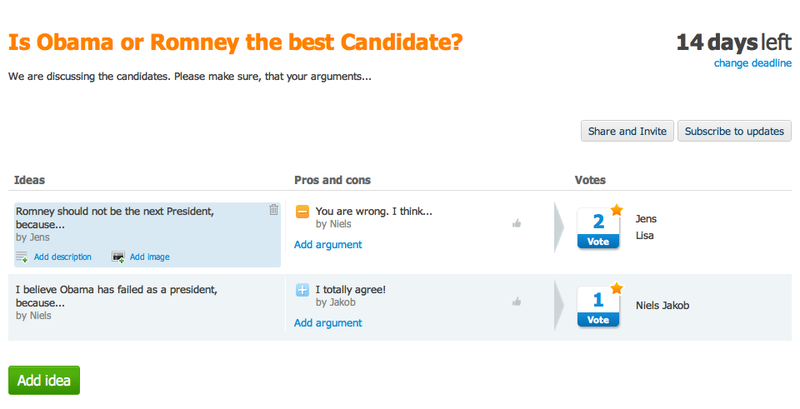 It allows students to discuss various topics online, and it gives them (and the teacher) the opportunity to evaluate each argument in the discussion. The tool is suitable for use within a dialogical and a polyphonic form of teaching. In the dialogical form of teaching Tricider can be used to support students' discussions of various topics. Students' ability to argue in writing, and their ability to discuss each argument in the discussion, may help to support, that more will be heard in the discussion, while the arguments remain afterwards and can be deepened orally subsequent. It is possible to let students post their arguments in preparation for class, and one may shut down the ability to contribute to the discussion at a specific time. In the polyphonic form of teaching Tricider can serve as a tool for students' generation- and rating of ideas. The teacher can ask students to each present 2 to 3 ideas in the tool, and then ask students to argue for and against their own and other students' ideas. The tool may be used in this way when starting a project work in groups. Tricider is free to use, and it doesn't require a login. You can share space with other discussion by using the ' Share and Invite ' button, and subscribe to the discussion-room, so that you receive an email when a new argument is posted. You can see a video about the features of Tricider here.